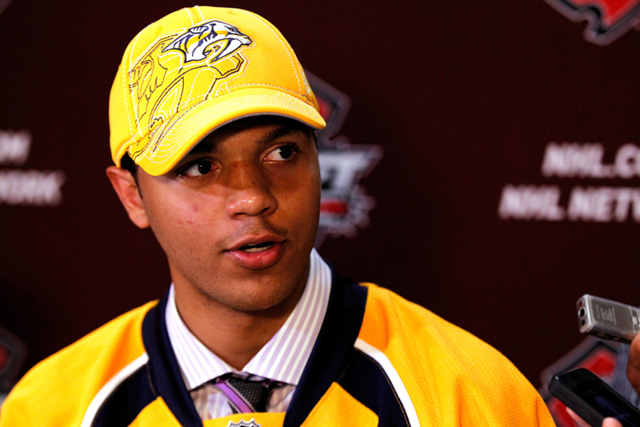 Seth Jones, the son of former NBA player Popeye Jones, became the highest selected African American in NHL draft history when the Nashville Predators have drafted the young standout with local connections. The Nashville Predators took Jones fourth in the first round of the NHL Draft. He is the son of Ronald "Popeye" Jones, who was a basketball standout for Murray State University in Kentucky and went on to play in the NBA. Seth is considered a top defenseman. At 6-foot-4 and 205 pounds, Seth scored 14 goals and had 42 assists in 61 games for the Portland Winterhawks this past season. Popeye Jones was playing then for the NBA’s Denver Nuggets, who shared their arena with the city’s NHL team, the Avalanche, when his son developed interest in the sport.